The Page 99 Test: Peter S. Carmichael's "The War for the Common Soldier"
Peter S. Carmichael's "The War for the Common Soldier"
Thankfully, page 99 intersects with some of the most important themes in my book. 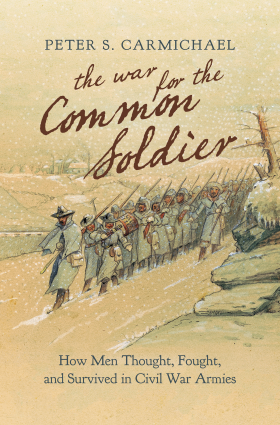 The page comes at the end of the chapter that explores how Civil War soldiers navigated the metaphysical confusion of war, when providential frameworks collapsed and men struggled to see divine will in a world immersed in violence. Soldiers quickly discovered that they could not rely on God absolutely and unconditionally if they hoped to survive in the ranks. Flexibility was essential. On both sides, men showed that they understood manhood, courage, emotions, and rules of conduct in highly malleable ways. They were not culturally hardwired by an unthinking code of militarized manliness as some historians have suggested. Men on both sides turned pragmatic in their faith without surrendering to “modern doubt.” On page 99 I summarize the lives of four men who are showcased in the chapter, reminding the reader that “they all remained faithful and prayed fervently, and at the same time they also became more pragmatic in their reading of the world” as they transformed into veterans. 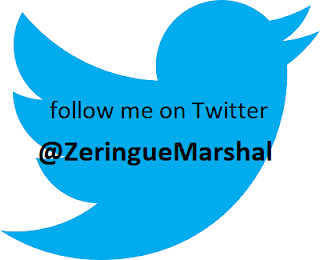 Witnessing the suffering and sacrifices of fellow comrades imparted hard lessons about how to survive in the ranks. 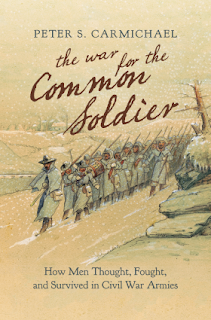 Learn more about The War for the Common Soldier at Peter S. Carmichael's website.